Resource center Utilizing Aftercare as Part of Recovery What Are the Benefits of Staying in a Transitional Living Home Post Drug Rehab? Transitional living homes, often called sober living homes, are places that people often move into after completing a residential addiction treatment program. They provide a middle ground between rehab and returning home. There have been numerous studies and copious amounts of research done into the length of time a person spends in treatment and subsequent recovery. Generally speaking, a longer time in treatment predicts better outcomes in recovery. The National Institute on Drug Abuse (NIDA) recommends that people stay in an addiction treatment program for at least 90 days and longer in some cases. Many people will also benefit from not returning home right away after completing an addiction treatment program. 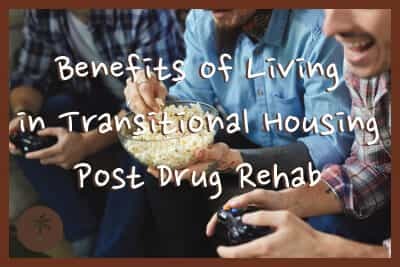 A transitional living home can provide a supportive environment wherein individuals live with people who are also in recovery and working to remain sober. There are many benefits of transitional living homes post rehab, outlined below. 1. Transitional living arrangements are free from the temptation of alcohol and drugs. Individuals living in these sober living homes are required to remain abstinent while residing in them. Someone fresh out of rehab may benefit greatly from not being placed back into a situation where drugs and alcohol are present. NIDA warns that addiction relapse rates are as high as 40-60 percent. Avoiding potential triggers early in recovery can help to prevent a relapse, or return to drug or alcohol use. 2. Sober living homes provide a stable home environment. Addiction can impact all parts of a person’s life, including finances, employment, and home environment. People battling addiction may not have a home to return to after treatment, or the environment may not be conducive to recovery. A transitional living home can offer stability and structure after a treatment program and also resources for the next stage of life. 3. Drug screenings may be utilized, which can enhance compliance. To ensure that individuals are remaining drug- and alcohol-free while residing in a transitional living home, drug tests may be done on a regular basis. This can help to keep people honest and provide motivation to stay sober. 4. Transitional living homes keep people in contact with a recovery community. There are different types of transitional living arrangements and some require that residents remain in formal treatment while living in them. Others may be less structured, but encourage individuals to utilize aftercare services and follow-up care that keep them in touch with trained professionals and provide access to crisis services, relapse prevention programs, support groups, alumni programs, and more. Individuals residing in these transitional living homes are typically in different stages of recovery, which can make for varying levels of mentoring opportunities as well. 5. A supportive environment helps to provide a healthy social network. Addiction can damage interpersonal relationships and increase isolation, and sober living homes can help to repair social skills and provide a network of peers who are going through similar circumstances. These residences are generally fairly small with a set number of residents, making it less overwhelming and providing for strong personal connections. A sense of community can be instilled, and positive social interactions can help to prevent relapse by offering encouragement and support. Most transitional living homes also have specific visiting times or days for family and loved ones. 6. Transitional living homes are often free from many of the stressors of everyday life. Daily life can be chaotic and difficult to manage at times, and during early recovery, stressors can act as triggers for a relapse. Transitional living homes can provide an environment that is less stressful and more predictable, and therefore with fewer potential triggers. They often also enforce curfews and set eating and sleeping schedules. Emotional health is enhanced by a person’s physical wellbeing, and someone who is well-rested, and eating balanced and nutritious meals, is more apt to be able to manage emotions well. 7. Support group meetings are encouraged. Those residing in transitional living homes often attend 12-Step meetings and encourage other residents to do the same. Studies published in the Journal of Psychoactive Drugs show that those who participated in 12-Step programs were more likely to remain abstinent for longer than those who didn’t. These programs provide fellowship and a safe place to share feelings and experiences with peers who understand. People engaging in peer support groups share a common goal of sobriety, and they work together to help each other achieve it. 8. Residents may continue to attend meetings, sessions, and educational programs while living in a transitional living home. Aftercare services and follow-up care can be very helpful in preventing relapse and moving a person forward in recovery. While many transitional living homes do not require that individuals attend formal treatment services, participation in therapy and other aspects of recovery is encouraged. Access to crisis services, relapse prevention programs, support groups, and educational programs may be provided. Those who suffer from mental health conditions in addition to battling addiction can continue to receive necessary care. 9. These homes provide a place to practice healthy habits learned in treatment. Drug and alcohol abuse damages parts of the brain that are necessary for feeling pleasure and keeping emotions regulated. Impulse control and memory functions are disrupted by addiction. These changes in the brain can take some time to reverse and transitional living homes provide time and space that are conducive to healing. Behavioral therapy and life skills training sessions during an addiction treatment program are important parts of reshaping the way a person thinks and therefore how they act. It can take time for a habit to form, however, and these residences can offer the needed time to make these healthy habits more ingrained. 10.Adherence to house rules provides structure and known expectations. It is almost always easier to handle things when a person knows what to expect. Most sober living environments will have a set of house rules that all residents are expected to follow. Often, the residents themselves will come up with these rules, and each person may have specific chores and responsibilities that they will attend to while living there. This can provide structure and a sense of accomplishment without adding undue stress. 11. Transitional living homes allow for a gradual transition, at each individual’s own pace, for re-entering society. Many transitional living homes allow people to remain in them for as long as they would like if they continue to follow the house rules. This can take the pressure off, as people are able to progress through recovery at their own pace and add elements of everyday life back in as they are ready to do so. Individuals may return to work or school while living in a transitional living home, for instance, and slowly integrate back into society and home life.